1. Dice the aubergine/courgette and sweet pepper. 2. Finely chop the flat-leaf parsley, basil leaves, and garlic cloves. 3. Cook the pearl barley in salted boiling water or vegetable stock. 4. Pour into a sieve and rinse under cold running water. Drain well. 1. Stew the diced vegetables, tomatoes and garlic in heated olive oil until al dente. 2. Season with salt, pepper and cumin, stirring well. 3. Add the cooked pearl barley and keep warm over a low heat. 1. To serve, add the finely chopped basil and flat-leaf parsley, drizzle with olive oil, stir well and serve. 2. Season to taste with Râs al Hânout and lemon juice. 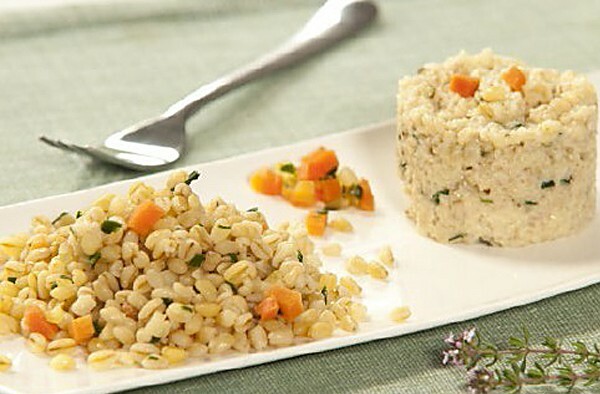 Level 6: Make sure that the vegetables and pearl barley are well cooked. Level 5: Crush the vegetables, add stock if required. Level 4 and 3: Finely mix the vegetables and the pearl barley separately. Add stock until required consistency is reached.